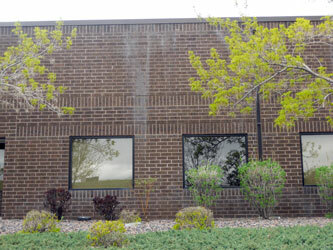 Serving the Denver Metro Area, Fort Collins and Aurora. Wet Sandblasting can help protect your commercial and industrial property and extend the life of your equipment by eliminating corrosion, rust, mold and mildew. 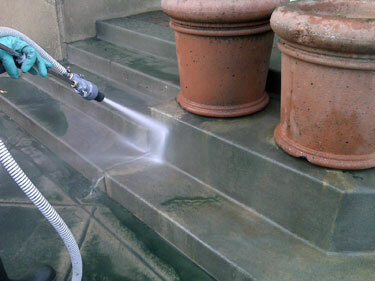 Wet Sandblasting is perfect for building exteriors, interiors, equipment or machined surfaces. 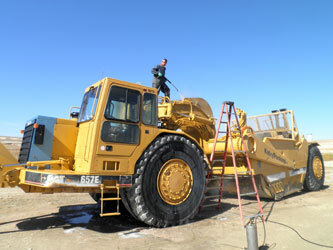 On many occasions sand blasting includes professional cleaning, de-painting or de-burring. Sandblasting, or water blasting, can be important components of industrial cleaning services, as well as a very effective method for removing graffiti or "tagging" on the exterior of buildings. Wet Sandblasting service can slow down aging and depreciation of your commercial and industrial assets, and improve the appearance of your property and equipment. When graffiti is tough to remove from your brick, split face block, limestone or concrete retaining walls let Top Gun remove it by wet sandblasting. Cleaners get very expensive and can take multiple applications. 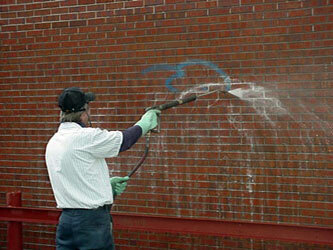 Let us do a free estimate and see what's best to remove your graffiti. When concrete, asphalt, paint or other materials need removed but you don't want to replace the whole area, call Top Gun. We have the experience and equipment to removal most problem areas. Wet Sandblasting also cleans Concrete & Asphalt Parking Lots, Playground Equipment, Fences, Roofs, Tennis Courts, Tracks, Heavy Equipment, Train Cars and Much, Much More. Our Experienced Crews are Trained to Deliver Fast, Efficient and Effective Service. Please see our Printable New Construction Clean Up Brochure for more information. For a Free Estimate or Demo call (800) 234-5685 or Contact Us. Top Gun Pressure Washing is one pressure washing company with three locations in Northern Colorado, Denver-Metro area and Colorado Springs. 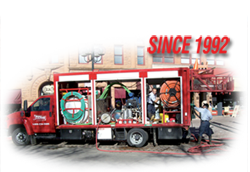 We provide services to Fort Collins, Boulder, Loveland, Denver, Aurora, Colorado Springs and every where in between! Let Us Put our Professional Staff to work for you today!